for Soil Testing - Conventionally particle size distribution analysis is carried out using pipette and hydrometer methods. Whereas in hydrometer method it is possible to determine particle sizes in the range 75microns, the method involves computation and it is time consuming. The pipette method can be used for determining only the percentage of specific sizes less than 0.02, 0.006 and 0.002mm as a percentage of total soil sample. The plummet balance method to determine sub sieve particle size for the entire range is very rapid and only manipulation of height of the balance, so that plummet sinks to the right depth is required. The percentage of soil in suspension is directly indicated by a pointer over a graduated scale. A vertical rod is mounted on a sturdy base having leveling screws. A pointer with steel pivots turns is jewel bearing an moves over a graduated scale. Scale graduations are market 0-100% x 2% To the other end of the pointer a plummet is hanged. Rack and pinion arrangement is provided on the vertical rod for adjusting the height. Supplied with a chart showing relationship between “K” and temperature of suspension of soils of varying specific gravity from 2.4 to 2.8 to help in solving stroke\'s equation. Supplied complete with one Perspex plummet one measuring jar and one rider weight for zero adjustment and rider weight for adjusting the pointer to 100%..
We are leading manufacturers, suppliers & exporters of Plummet Balance For Testing Lab for Soil Testing Lab. 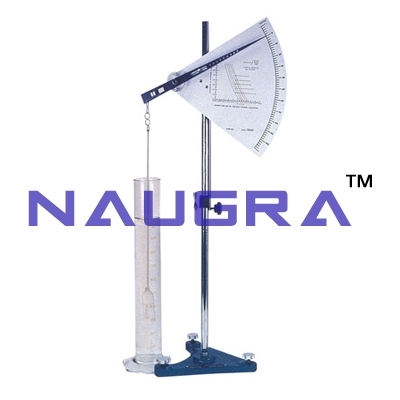 Contact us to get high quality designed Plummet Balance For Testing Lab for Soil Testing Lab for schools, colleges, universities, research labs, laboratories and various industries. We accept bulk orders for government tenders in all countries around the globe.